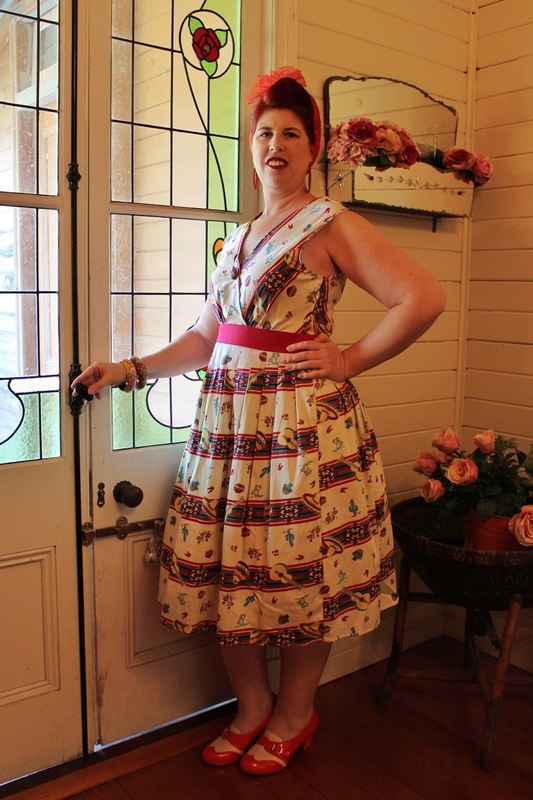 It's made in the US by the brand Bettie Page Clothing and is called Sugar Beat (fiesta stripe). 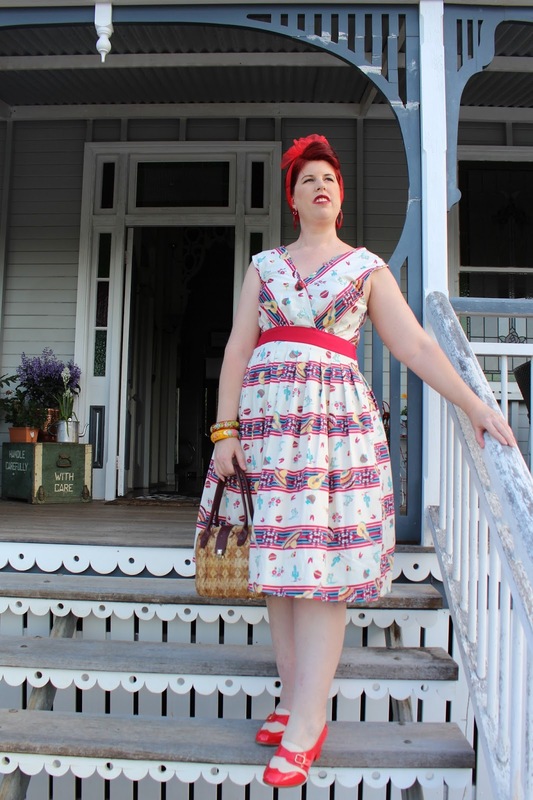 As soon as I saw this dress hanging on the rack in Aunty Charmings market store, I wanted it! I love the colours and the Mexican style print with the guitars, sombrero hats, cactus plants, pottery and stripes. This dress is made from a soft woven cotton material and is very comfortable to wear. Other features include the red band around the waist, pleated skirt, cap sleeves and a plunging neckline and back. Note: I had to place one of my brooches (lady beetle) in the neckline, so it wouldn't gape and for the sleeves to stay up on my shoulders and not fall down consistently. 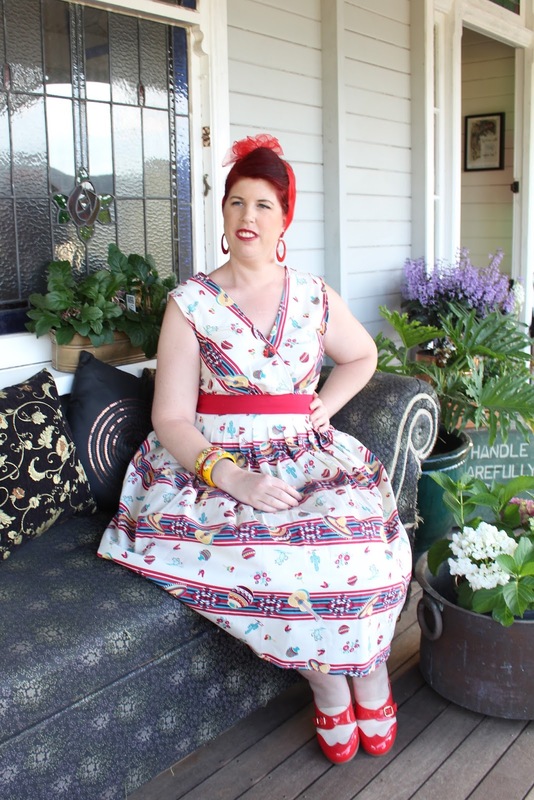 Sizing ranges from 4 right up to 26, there are still some sizes in this exact dress on both the Bettie Page ($128 US) and Aunty Charmings ($100 AUS) websites plus shipping costs. These photos for this week's blog post were taken by a follow pinup friend at her beautiful Queenslander homestead, my friend and her husband's home is located on acreage in the outskirts of Gympie, Queensland. We had a lovely afternoon together, eating yummy food, chatting and taking photos for my blog! Please watch it, if you can, it's very entertaining! In other news, over the weekend just gone I went down to the beach to take blog photos and got really burnt on my back and shoulders. I didn't apply sunscreen, naughty me I know! I shall be applying sunscreen from now on, especially now it's starting to come into summer here where I live in Australia. 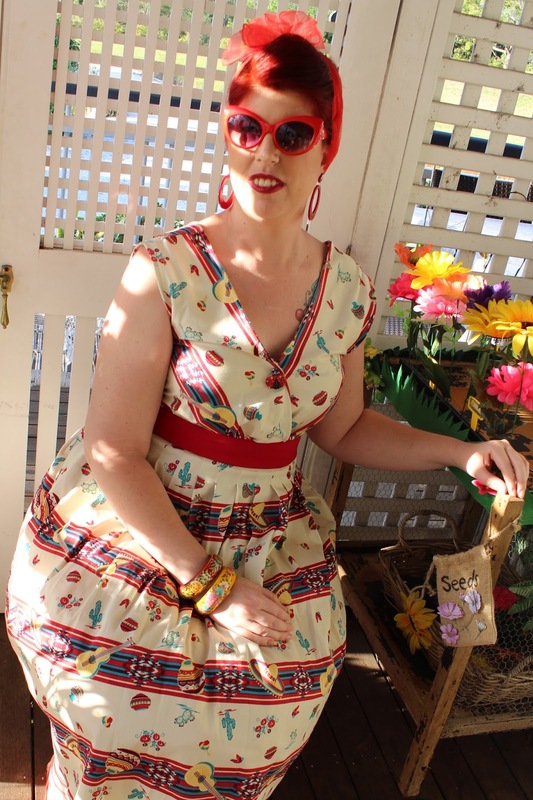 This weekend I plan to drive to Brisbane, Queensland to attend a pinup picnic in the park on Sunday (had a lovely time last year and this one is going to be even bigger and better). Also I'll be taking blog photos down there at a another beautiful old manor/homestead. Plus catch up with family and friends as well. Don't be too jealous of our weather, it's been really hot the last week where I live in Australia!